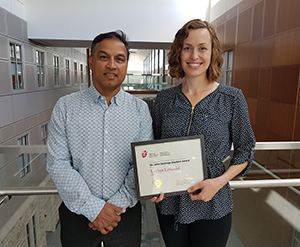 Dr. Nazeem Muhajarine, left, congratulates PhD candidate Larisa Lotoski on receiving the prestigious Dr. John Hastings Student Award during the CPHA 2018 Public Health Conference last month. SPHERU trainee Larisa Lotoski received the Dr. John Hastings Student Award during the Canadian Public Health Association’s (CPHA) 2018 Public Health Conference last month. Larisa’s abstract was selected as the best student research paper (PhD) at the CPHA scientific meetings in Montreal. The award is named after Dr. Hastings and his commitment to and belief in students as the future of public health in Canada. Under the supervision of Dr. Nazeem Muhajarine, Larisa has been studying the results of the Seasonality and Active Saskatoon’s Kids Study (SASK), which ran from 2014-2015. The study sought to better understand how seasonal changes and neighbourhood design can effect children’s physical activity and sedentary behaviours throughout the year. The study found that children in newer, safer, and activity friendly, were more sedentary as a result of fewer amenities when compared to children in other neighbourhoods with more things to see and do. The Office of VP Research also wrote a profile and highlighted Larisa's work on the study and on receiving the award. Congratulations on this outstanding achievement, Larisa!